A 40-year-old man is receiving VA ECMO support following an out-of hospital cardiac arrest. He is also receiving continuous renal replacement therapy (CRRT) for an acute kidney injury. 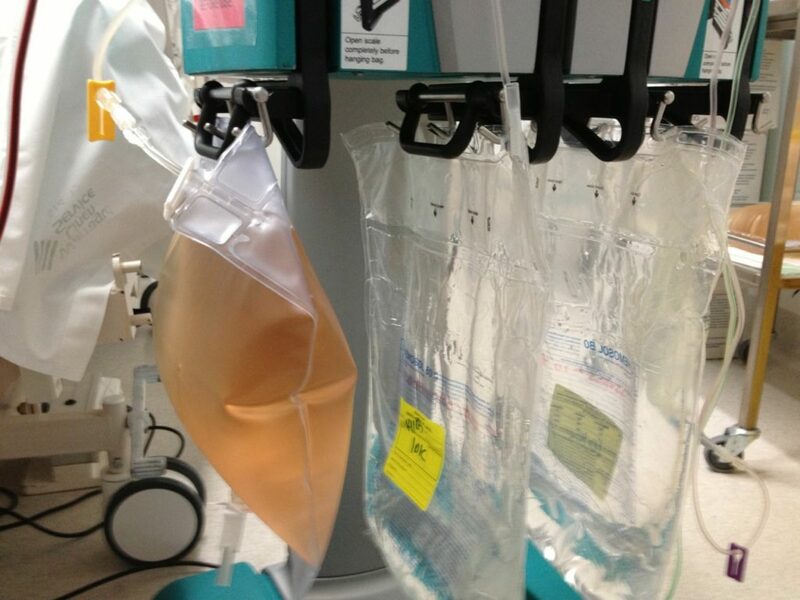 The nurse comes to tell you that the effluent bags of the CRRT have developed a reddish hue. The nurse comes to tell you that the effluent bags of the CRRT have developed a reddish hue. Q1. What laboratory test should you perform next? Check a plasma free haemoglobin (PFHb). This is the most sensitive test for haemolysis. The laboratory test result is 1.2g/dL. Q2. What does this mean and what are the possible causes? The result suggests significant haemolysis complicating ECMO. The 2013 ELSO guidelines state that PFHb should be <0.1 g/dL under most conditions and that PFHb >0.5 g/dL should be investigated as to the cause. Haemolysis affects about 1 in 5 ECMO patients (according to a meta-analysis by Zangrillo et al, 2013). Haemolysis does not occur during ECMO unless there is a problem in the circuit or the patient. Haemolysis in ECMO patients is associated with acute kidney injury and multi-organ dysfunction. Haemolysis due to shear stress is less common with modern centrifugal pumps than it was with the older roller pumps previously used for ECMO. Q3. What is your approach to investigating this further? Q4. How often should routine plasma free Hb (PFHb) sampling be performed and what is a normal operating level? PFHb is routinely checked 6 hourly to screen for haemolysis in ECMO patients at the Alfred ICU.